1. First, make the icing. Place the soya yogurt in a clean muslin cloth over a bowl, and allow to drain overnight, leaving you with about 200g cream cheese. 2. Put the cream 'cheese' into a blender, and add the agave syrup and melted coconut oil. Blend until it emulsifies into a mayonnaise-like texture, then put in the fridge to chill. 3. When youre ready to bake your muffins, preheat the oven to 180⁰C, gas mark 4. Take a standard 12-muffin tray and line with muffin cases. 4. To make the flax 'eggs', mix the flaxseed with 9 tbsp (approximately 135ml) water, mix well and leave to soak. 5. Next, put the flour into a large mixing bowl, add the baking powder, bicarbonate of soda, allspice, cinnamon, salt and chopped walnuts, and mix well. 6. Put the sunflower oil in a separate bowl and add the maple syrup, grated carrots, vanilla extract and flax 'egg', and mix well. 7. Make a well in the centre of the flour mixture, pour in the carrot mixture and mix well to combine. Divide the mixture between the muffin cases, and bake for 15 minutes, or until an inserted skewer comes out clean. 8. 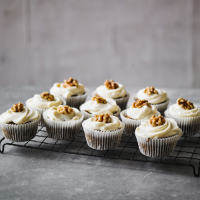 Leave the muffins to cool, then top with the icing and whole walnuts. This recipe was first published in Tue Dec 19 16:42:00 GMT 2017.